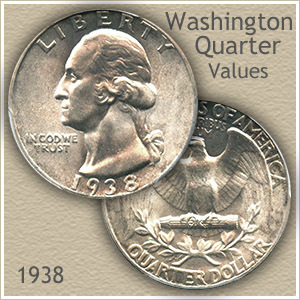 The 1938 quarter value is $2.80 each, it's the starting value for a coin in "Good" condition. Two mints produced Washington quarters in 1938. Philadelphia and the San Francisco mint. The more valuable of the two is the San Francisco coin, identified by the "S" mintmark on the reverse. Other elements do contribute to raising the value higher, particularly the condition of your coin. After finding the "S" mintmark, determine the condition. The very nice "Uncirculated" Washington quarter pictured is a highly sought coin. The older dates are commonly found very worn, see if yours is in a more collectible condition, by comparing it to the "Grading" images below. A just slightly better looking 1938 quarter is worth a premium. The coin value chart breaks the prices down by date, mintmark and state of preservation. The "1938-S" is a quarter minted by the San Francisco mint in 1938 and values are given in four different "Grades." 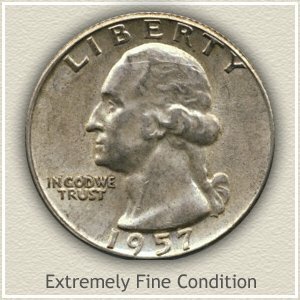 A section on how to judge the condition, and grade your coin is found below. From brand new "Uncirculated" condition to very worn, "Good" condition, is reflected in the examples. 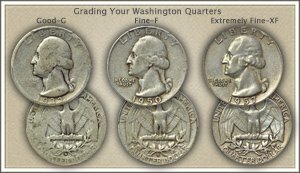 Line your Washington quarters in a row, judge their state of preservation and assign each a "Grade." As you proceed, handle each coin carefully, keeping in mind, value is highest for "Uncirculated" coins. 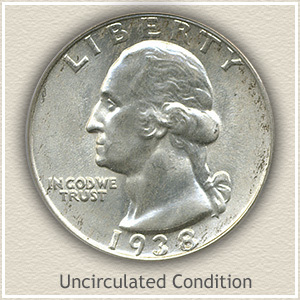 Uncirculated: A 1938 quarter in the "Uncirculated" grade has no wear on its surfaces. The appearance is as if freshly minted. Some develop natural toning over the years, and is considered very desirable. This combination of factors results in the most collectible and valuable coins. Extremely Fine: Still sharply defined with abundant detail remaining. Examine the high points of the hair, curls above the ear, the cheek and neck line for minimum wear. The coin should standout from the rest as clearly detailed. Fine: Most of the fine detail in the hair is lost, the area around the ear is smooth, but the major design elements are still bold. Overall a pleasing coin. Good: Here we are at the low end of the desirability scale. The lettering is now connected to the rim and only the major details of the portrait remain. The coin does not appear mistreated, just well worn. 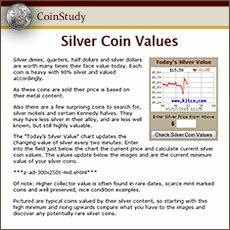 Check your coins with the values chart. Most of the silver Washington quarters value is tied closely to the price of silver. However, a few rare dates and mintmarks are very valuable. Including more relating to your 1938 quarter value. 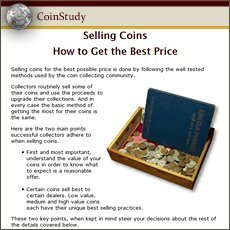 Easily find how much your old coins are worth. From Bust Quarters to Seated Liberty, Barber, Standing Liberty and Washington quarters. 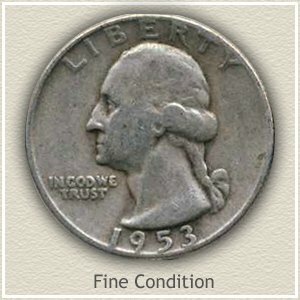 All series include Grading Images to judge the condition of your coins and coin value charts. Do you have other coin denominations? All old US coin values. It is an excellent index with images and text links to all coin series, from Cents to Gold. Value charts, grading images and descriptions uncover how much your box of old coins is worth. How does a Washington quarter rise to a value over $400? It took an outstanding 1938-S quarter featuring a bold strike, silver white luster with attractive light toning, and barely noticeable marks. Auctioned by DLRC Auctions it realized $402.50. A proud addition to any collection. The sale was conducted through an online internet auction. 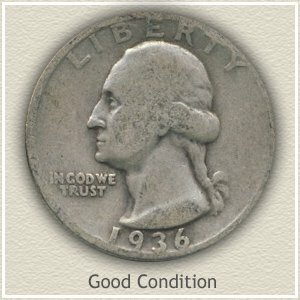 Which points to an excellent way of viewing coins and gaining an understanding of your 1938 quarter value.